If we look at the history when ever Muslims fell in mutual disputes, started sectarian quarrels or ignored conspiracies of enemies, destruction became there fate. Look at the present poor situation, in spite of preparing for the upcoming threats we are busy in mutual disputes. We are ignoring advancing storm; the horse trading for power is going on. Due to administrative weaknesses or due to evil intentions of elite class the deteriorating economic situation has weakened whole nation. In spite of abundant natural resources we are forced to beg from profit taking institutions. This begging habit of our rulers has hurt our self respect. Other wise how is it possible that Prime Minister of country due to public pressure announces to withdraw the increase in petroleum prices and other country objects it? Why Hillary Clinton is against any decisions in favor of Pakistani public? If they are worried about loosing the loans issued by IMF to Pakistan or a delay in their repayments then they should have objected the increasing corruption of rulers and looting of national treasury in spite of objecting the withdrawal of increase in prices. They should have stopped the transfer of black money which is being transferred to their banks from national treasury of Pakistan. The volume of this black money which has been transferred to banks of these countries by our corrupt politicians is 50 times more than the loans given to Pakistan in last 60 years. On the other hand American Ambassador standing on our land orders us, “you should benefit from Indian economy, invite India for friendship forgetting all disputes with India including state terrorism in Held Kashmir” (on 28th January 1948 US Ambassador had tried to teach us same lesson that India is a big economy of region and Pakistan is nothing in front of India so Pakistan should accept all Indian demands and forget all disputes). Now it is hard to decide that are we independent nation or slaves of USA? Actually corruption, bribery, black marketing and such like diseases have so much infiltrated into our society that we have become even ignorant of our defenses. The peoples infected by above diseases are so much influential that condemning these evils openly is equivalent to making trouble for self and an unforgivable crime. These all elements are much more dangerous than terrorism, every citizen has to face them several times in a day, he resists against them to his capacity but alas! He is loosing against mafia. Because he does not know that he is not facing less than 1 percent of total population of elites but imperialistic forces behind them. These forces had made plan of economical and social destruction of Pakistan in order to control it. In order to implement their plan they are attacking from different sides, sometimes they conduct terrorist attacks through bomb blasts or suicide attacks, and sometimes they terrorize people by increasing prices in the name of safe recovery of their loans. Through both acts they want to make Pakistani public pessimistic about stability of country. So that general public of Pakistan becomes ignorant of Pakistan’s ideological and geographical boundaries. The practical show of this has been observed on 26th November 2008, when a majority of Mumbai people had the point of view that attacks on hotels is plan to remove Chief of ATS along with his colleagues by Indian Army, RAW and extremist Hindus. While we were accepting without any evidence that non-state actors from Pakistan are involved in it. As soon as these attacks started Indian govt., private and state TV channels of India started blaming Pakistan Army and ISI for these attacks. The most astonishing fact is that this drama starts on 8:30 pm and after 2.5 hours an Indian channel identified a terrorist known as “Qasab”, and more astonishing from this was a documentary film of a Private Pakistani TV channel which showed birth place of Qasab in Pakistan, training camp of Lashkar-e-Taiba in Azad Kashmir from where he got training, his transfer from there to Karachi in a strange house, here Pakistan Naval officers trained him for 15 days for voyage over sea and gorilla warfare in sea, (in all the countries such training takes a minimum period of one year however Pakistani TV channel not only found his secret place but also addresses of those Naval officers who trained him). After completing training from which route he reached to Mumbai and how he attacked Mumbai hotels, all this is a worth watching fairy tale. After documentary film of Private Pakistani TV channel India had no need to further accuse any one but India continued to pressurize Pakistan claiming that Ajmal Qasab is the central character/master mind of these attacks. 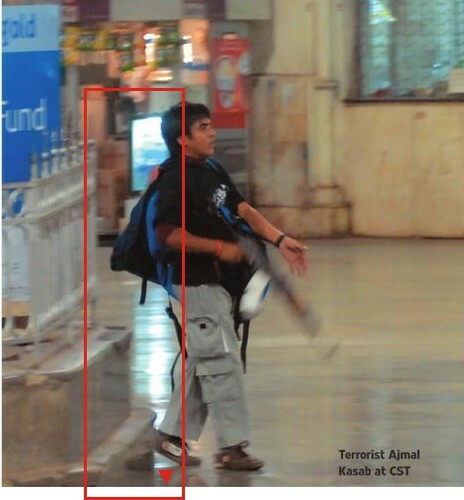 As the proof a picture of Ajmal Qasab was issued to the international media showing him holding AK-47 rifle in the City Terminal of Mumbai Railway station. This is the only picture of the only one person out of ten who survived. You can see this picture on any internet website or newspapers of the world. Here I would like to make one thing clear that from the entrance of Oberoi Hotel and Taj Mehal Hotel to the TV Lounge and other passages there are CCTV Cameras installed to keep an eye over the movement of the residents. In city terminal of Mumbai railway station there are also many of such CCTV cameras to keep an eye over the passengers. But in spite of all these recording devices India has failed to bring forward any such footage recorded by these security cams in which terrorist are firing bullets, or moving in between these places. What is the reason? Whether the CCTV cameras were defective or the terrorists playing on their lives were shy firing in front of these cameras? Let us now discuss the picture of Ajmal Qasab and shining Lounge of Mumbai city terminal railway station; you will never see such a clear picture made by CCTV camera that even if there is a straw on the floor camera is clearly observing it. Then the railway platform of a city like Mumbai where there is always crowd of passengers from the whole city. This above mentioned railway station is so much crowded that one hardly founds place to stand, it is filled with the passengers and their luggage, then where all this disappeared as soon as he arrived? The passengers running to save their lives hade enough time to take their luggage? Moreover he has short height, in spite of this the image has not been made from the height more then the height of the eye of a long height person, have you ever seen a security cam installed at the height of 6 feet? That also on the most crowded railway station of the country? Let us now discuss different aspects of the picture. God knows why experts preparing this image ignored this blunders/short comings in the picture. Look at the reflection on the right side of the Ajmal Qasab on the ground from his shoes knees, due to bright light from the distance the shadow of his foot is right, while the reflection of his leg behind is different. Moreover look at the right side of him over the marble of the floor, when experts were asked about it they were of the view that it is the reflection of the jogger like boot worn by him, while on the spot there is no such light falling on him or floor, which can overtake the bright light mentioned above and reflect shadow of moving Ajmal Qasab. In this way if you look at the “Body Langauge” of Ajmal Qasab, his facial expression, his purpose behind presence over Railway station, the weight he is carrying, after analyzing all these aspects the difference between them is much clear. In his right hand he is carrying AK-47 rifle and on his left shoulder you can see 3 bags. In the way he faced a brigade of Indian army for 60 hours, and as initial point he arrived at railway station then he should be carrying ammunition enough for 60 hours in these bags, a spare rifle (in case one becomes defective or is lost) uncountable magazines filled with bullets (because along with facing army he has to fulfill his purpose of murdering people), pistol, dried food and water etc. keep this in mind that such a big cache can be stored in a specific location or building, but no one can carry such a heavy weight and move while firing n fighting. He was also a human like us made of flesh not a robot, his face should express his worried-ness and his shoulder should be leaned. But he was moving just like characters of Punjabi films of Pakistan as he is not going to kill people but just pose like that. The brown color over the right wrist of Ajmal Qasab is also beyond understanding, if it is shirt then in should be visible over left wrist. Not only that what argument will you provide for orange colored thick thread over his wrist? This thread is used by persons belonging to Bajrang Dal, RSS or Shiev Sina for their identification. Then was he posing as extremist Hindus? If it is true then he should have sign over his forehead too, while India is struggling to prove him as a Muslim extremist. Much more can be written over his picture. Possibly pro-Indian elements in Pakistan might not accept my point of view, then they should prove that where on his body he was so much severely hit so that this child Jinn paralyzed without any apparent wound or sign. According to Indian govt. 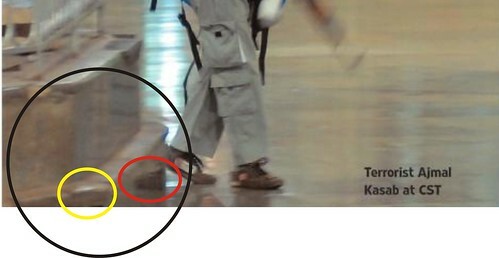 he was arrested in critical situation and severely wounded but in the TV footage a little cut over wrist and neck and little blood seeping from his leg is visible. Such like usual wounds are even self made to register case against enemies in villages, some people even they fire over their legs and arms and go to police station to register FIR against their enemies under 307. Moreover if you want to know the truth about the Ajmal Qasab then look at any Indian newspaper of 19-20th December 2009 that what he has said in front of judge, after publishing this statement not only journalists were banned from going near the courts but the official lawyer provided to him was also murdered. Ajmal Qasab is such a character of this era that for years it will be written for years about him. Mumbai Police succeeded in completing investigation against him in 1 year while investigations of Samjhota Express are not complete even after 4 years had passed, at least why? Under the accuse of destroying/sabotaging Samjhota Express 3 on duty and 1 retired army office is under the Police “Protection”. One out of them when dramatically confessed his crime few days ago and Pakistani govt. has demanded details (alas! Pakistan govt. had done that three weeks before 26th November 2008 before the murder of Hemant Karkare when Karkare has presented all culprits in court along with proofs under the accuse of sabotaging Samjhota Express), India has replied to this demand, “the demand of Pakistan is before time, details cannot be provided”.